Let us contemplate our own mortality and ‘refute’ the nihilism of ‘mercy’ killing with artworks of Beauty. Classic Christian art such as ‪Purcell’s Elegy for the Funeral of Queen Mary can be so uplifting! Let us also draw upon all Art that has something of God in it, or that through it something of God can be refracted, such as Kurosawa’s Dreams and Rumi’s poetry. hath but a short time to live, and is full of misery. He cometh up, and is cut down like a flow’r. and ne’er continueth in one stay. Kurosawa’s Dreams ends with a funeral procession for an old woman in a village that plays like a wedding. Instead of mourning, the people celebrate joyfully as the proper end to a good life. The whole village turns out for her funeral. Kurosawa stages the funeral procession as a celebration of a life. Music is played, a song is sung, people dance in the procession as if it is a parade, and it’s a joyous scene. At the end, the traveler picks and places his own flower on the rock like the children before him. As for Rumi, the mystic poet and Spiritual Sufi Master, let the ecstatic vision of his hauntingly beautiful ‘Death’ poem speak of itself! How can there be an end? But in reality it is a dawn. Of a seed named human? Like Joseph from the well? 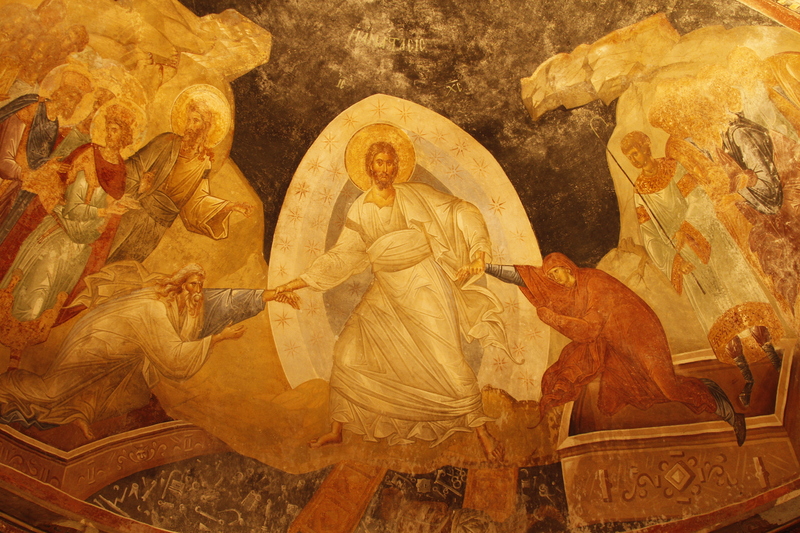 Icon on top: Harrowing of Hades, fresco in the parecclesion of the Chora Church, Istanbul, c. 1315; raising Adam and Eve is depicted as part of the Resurrection icon, as it always is in the East. This entry was posted in Film and Animation and tagged AfterLife, Art, Asian, Beauty, Christian, Cinema Review, Classical Music, Death, Dreams, Elegy, Euthanasia, Film and Animation, Iran, Islamic, Jalāl ad-Dīn Muhammad Rūmī, Kurosawa, Mercy Killing, Mystic, Oriental, Persia, Persian, Poet, Purcell, Rumi, Sacred, Sufi, Theologian. ← Solomon, I have outdone thee!